Dierks Bentley brought his summer themed Mountain High Tour to a rainy St. Louis on Saturday night. Despite the inclement weather, Bentley played to a full house at Hollywood Casino Amphitheatre. 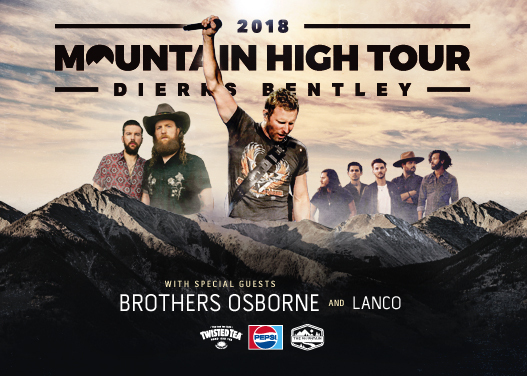 Accompanying Dierks was Lanco and Brothers Osbourne. Back by popular demand, the Anheuser Busch Boys started off the evening. And finally, Bentley took the stage. Bentley walked onto the stage playing a small excerpt of the title track of his album “The Mountain,” which will be released June 8th. Bentley let the crowd know how the night would go shortly after, throughout the course of the night he would take them on a journey up to the top of the mountain. Throughout the course of the journey, Bentley dusted off various songs from his catalog. Including “What Was I Thinking,” a solo rendition of “Different For Girls,” “Black,” “Every Mile a Memory” and fan favorite “Drunk on a Plane.” In one of the somber events of the evening, during the course on performing “Women, Amen” Bentley displayed fan supplied pictures of women who inspired them. To help the crowd achieve their goal of reaching the summit of the mountain, Bentley broke out his 2015 single “Riser.” And finally, after Bentley completed his set, Joe Walsh’s “Rocky Mountain Way” brought the crowd finally to the top of the mountain.